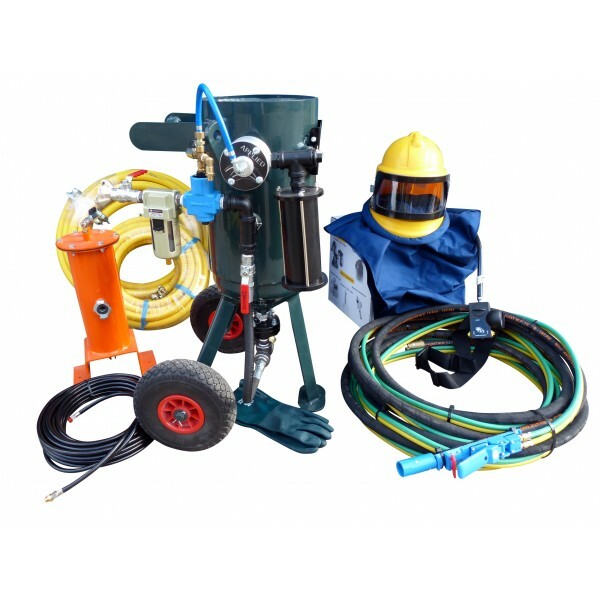 A COMPLETE START UP PACKAGE OF BRAND NEW EQUIPMENT. ALL YOU NEED IS A COMPRESSOR (MINIMUM 50 CFM ), AND ABRASIVES. THE 20 LITRE POT IS THE SMALLEST IN THE RANGE, AND IS PARTICULARLY SUITABLE FOR STONE MASONS, SMALL WORKSHOPS, CLASSIC CAR RESTORERS, ETC. THE WHOLE PACKAGE WILL FIT INTO MOST FAMILY SIZE ESTATE CARS. GREAT FOR USE WITH BLAST CABINETS .... TURN YOUR SUCTION CABINET INTO A PRESSURE BLAST CABINET. BUILT WITH HIGH QUALITY COMPONENTS TO ENABLE CONTINOUS DAILY USE FOR MANY YEARS...... INCLUDING A REMOTE VALVE AND DEAD MAN HANDLE TO ALLOW FULL OPERATOR CONTROL FROM THE END OF THE BLAST HOSE. * 10 METRES OF 13mm id BLAST HOSE. * FREE STANDING BREATHING AIR FILTER. * TUNGSTEN CARBIDE NOZZLE (LONG LASTING). * REMOTE VALVE & DEAD-MANS RELEASE HANDLE. * 2 x 15 MTRS OF 3/4" COMPRESSOR AIR HOSE.